Tao Hu has been on the frontlines of U.S.-China environment cooperation for two decades, first as an ecologist and environmental economist at China’s Ministry of Environment’s Policy Research Center for Environment and Economy, and since last year in his current role as China program director at the World Wildlife Fund in Washington, DC. Hu’s professional “hats” have changed markedly over the years, but he has consistently focused on developing new policy and market tools to address China’s environmental crises. Before speaking at the Wilson Center last month, the China Environment Forum asked Hu a few questions on his evolving work to clean up China’s skies and waterways. My family is originally from the Hu village in Shandong Province. There are over 6,000 people in our village and almost all of us share the same last name. However, I was born and raised in Urumqi city in the Xinjiang Autonomous Region. Thirty years ago, I moved to Beijing for college and then stayed on to work at the Ministry of Environmental Protection’s Policy Research Center, which provides research and analysis to policymakers. After 20 years working there, I moved to Washington, DC, in 2012. 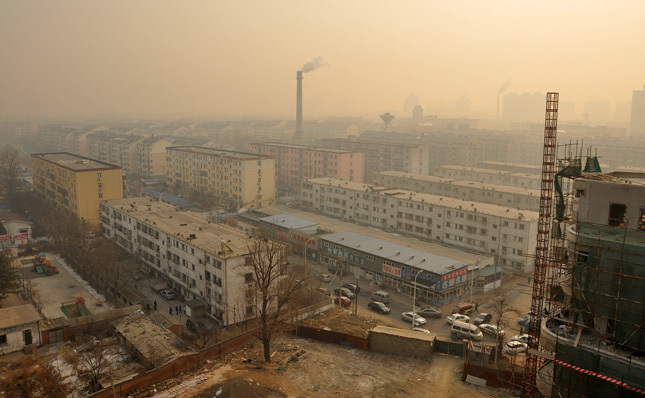 You’ve been working in China’s environmental field for over two decades. What has been the most significant change? Two decades ago during the winter, people on the streets wore cotton face masks to keep warm; today people wear anti-air pollution masks. So not only is the air quality getting worse, but temperatures are rising as well. What has it been like to work on China’s environmental issues at a government entity and now at a U.S.-based NGO? In moving from the Ministry of Environmental Protection’s Policy Research Center to WWF, I feel like I’ve jumped out of the valley and now have a bird’s eye view of the whole mountain range. I have gained a broader comparative perspective. For example, it is now easier for me to understand how similar policies on environmental impact assessments are so poorly enforced in China compared to the United States. At its core, it’s a governance issue. Thus, in my research, I have increasingly looked at the impact of governance in promoting successful environmental policy implementation. You started out as an ecologist and then became an environmental economist. How did you get interested in environmental economics? In college, I became interested in wildlife and ecosystem conservation and ended up majoring in ecology. While conducting field research in Jiangsu’s Dafeng County, the head of the county asked me, “You said the ecosystem is valuable. So tell me, how much money is it worth?” I was stumped. How do you assign a price tag to a plant or animal species? That was the starting point for shifting my studies from ecology to environmental economics. I realized very quickly that placing a monetary value on an ecosystem is not easy, but critically important to grabbing the attention of policymakers. Environmental economics also provides policymakers with concrete, market-based instruments to manage the environment. What type of economic policies do you think could be most helpful to reduce China’s mounting air pollution, which ultimately is linked to the country’s CO2 emissions? I think the most powerful of all market-based tools is a resource and environmental tax (RET). Currently, China relies mostly on a command-and-control system, comprised of non-market based measures that rely on regulations and penalizing polluting offenders. But as we have seen from the deteriorating air and water pollution, this is not enough. Current market signals do not incentivize coal users to reduce consumption. Twenty years ago, the coal resource tax was 5-10 yuan/ton and the tax is still 5-10 yuan/ton. When adjusted for inflation, China coal prices today are actually cheaper than they were in 2006. Our current research at WWF suggests the Chinese government should adopt RET reform. When the government places an environment tax on fossil-based fuels or water that internalizes the environmental costs, it sends a pricing signal to the market. As the cost of coal rises, consumers and producers will be more likely to turn to cleaner energy sources such as solar and wind. We suggest taxing coal at the original source – when it’s mined or imported – and gradually increasing the RET by 0.1 percent per day. This gradual, exponential escalating tax would be shared between the central and provincial governments and used to subsidize renewable energy research and development. If China incorporates these environmental externalities into pricing, do you think consumers in Western countries will be willing to bear the cost? Some economists argue that as production costs rise, manufacturing will be forced to move to less developed nations. I don’t think China has a choice: China must integrate environmental costs into its production cost. Otherwise, it will continue to face hazardous levels of air quality. When China internalizes environment costs into products, it doesn’t mean that manufacturing has to move to other countries in the short term. For instance, consider labor costs. China’s labor costs are already much higher than Cambodia, Laos, and Vietnam, but why are industries still staying in China? Think about the Pearl River Delta and the Yangtze River Delta. Ninety percent of electronic products in the world are made in these two regions. There’s an entire supply chain “ecosystem” with skilled labor embedded in these areas. Many of the inputs for your computer, for your iPhone, are in close proximity of each other there, driving efficiencies and reducing production costs in the supply chain. In the long term, as China develops and upgrades to higher-value added industries, these polluting industries will be gradually phased out. But we don’t yet know which countries are going to receive these industries, maybe Southeast Asian countries, or Mexico, or India. Sources: Bloomberg, The Guardian, Reuters, The White House. Photo Credit: Beijing air, courtesy of flickr user Chris Aston.